Most children love playing musical instruments. The banjo is a great choice for children of all ages – you can choose a toy banjo for younger children and a small ‘real’ one for older children or those who want to learn to play properly. There is a range of books available to help children learn to play, as well as plenty of accessories to make playing even more fun. There are a few things to bear in mind when buying a new banjo for your child. However, some kids might like to play other musical instruments, like the piano or drums, for example, so make sure to pick something they have a genuine interest in. Size – A full-size banjo might be too big for your child to play especially if they are younger, or are quite small for their age. Make sure they will easily be able to reach right to the end of the neck of the instrument, so they can play it properly. Materials – Check what materials the instrument is made from. Cheaper, lower quality materials are fine for those who are looking for something to play around with rather than learning to play properly. If your child is going to be learning to play seriously and taking lessons, it’s worth investing in a higher-quality piece made from the best materials. Banjo or ukulele? – For younger children, the ukulele can be a better place to start, as it is smaller in size and has fewer strings. There is also a hybrid instrument known as the ‘banjolele’ which offers the best of both worlds. We’ve included a few of these in the review below for comparison. Left or right-handed? – If your child is left-handed, they might struggle to play a standard instrument. It’s best to opt for a specially designed left-handed version to make learning to play easier. This cheap banjo offers great value for money. 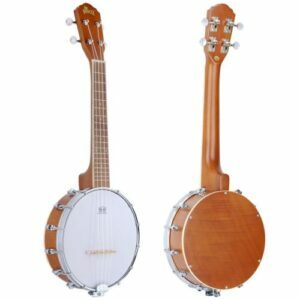 It is really high quality and is full sized making it perfect for older or bigger children, who are looking to get into playing the banjo seriously. The instrument is also perfect for a teenager or adult learners. The banjo also comes with a free book, perfect for beginners to pick up their first chords. The Resoluute banjo is ideal for playing a variety of styles of music. It can be used closed-back or open-back, perfect for creating different sounds. The 5 string banjo has a geared fifth tuner, and 24 brackets to keep the head tension even. It also features a maple fingerboard, which is easy to play on. Overall, this is a great banjo for older children or beginners. It offers many of the features you would expect from a much more expensive product. This banjo toy is great for toddlers and preschoolers. It is made from solid wood, making it the perfect musical instrument for children who can be a little rough! Also, it’s possible to replace the strings if they get broken – ideal for when your child gets too excited making their own songs! The small banjo is just the perfect size for younger children – it’s a great way to get them used to holding and playing the banjo until they are able to learn properly. The Plan Toys banjo is ideal for toddlers who want to be just like their older siblings or mom and dad who play the banjo or guitar! This Winzz banjolele is easy to play, like a ukulele, but offers the classic tones of a banjo. 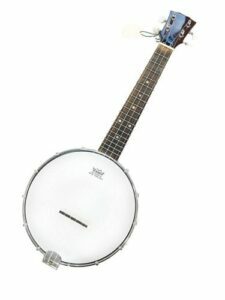 At 24 inches long, it is shorter than a traditional banjo, making it potentially a better choice for children. It comes with synthetic strings, which are a little easier on the fingers than steel ones – ideal for beginners. The banjo comes almost fully assembled, meaning parents will have an easy job getting it ready to play. The bridge will need setting up and the strings tightened and your child will be ready to rock and roll! The banjolele also comes with a padded bag for safe storage and transport. This banjo ukulele is ideal for children, as it is a few inches shorter than a standard banjo. If your child already knows how to play the uke, this a great step up to something different. It plays just like a ukulele but sounds like a banjo. Therefore, it is also great for experimenting with different styles of music. The banjolele is much louder than a ukulele, making it great for playing along with other instruments as part of a band. The banjo uke is made from mahogany and rosewood, for a premium look and feel. Weighing in at just over 3 pounds, it’s light enough for kids to be able to carry around and play comfortably. This toy banjo is ideal for toddlers and young children who want to start learning to play an instrument for fun. It has 4 strings which are nylon, making them easier to play than steel ones. This is great for little kids as they won’t get sore fingers when learning. Unfortunately, the strings can’t be tuned, making this more of a toy than a serious instrument. The children’s banjo is ideal for getting youngsters interested in music and developing a sense of rhythm at an early age. 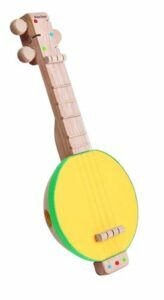 Plan Toys also make a range of other wooden musical instruments for preschoolers – why not start a band with your toddler and their friends! The banjo is strong enough to stand up to some rough play from young children and will give many years of enjoyment. 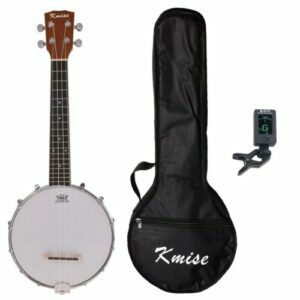 This Kmise banjo is a smaller size than traditional banjos making it ideal for children. The instrument has 4 strings and plays in the same way as a ukulele. However, it has the resonance and sound quality of a banjo. The banjo uke has an interesting look, sure to be popular with kids of all ages. The clear body is different and unique, and the neck and head are made from Canadian maple. Therefore, the banjo is great quality and built to last. It is ideal for beginners but will continue to provide years of use. This banjo ukulele starter pack is ideal for beginners of all ages. The 23 inch instrument comes with a carry case and a digital tuner, meaning kids can start playing right away. The banjo comes in a choice of 5 different styles, meaning there’s something to appeal to all tastes. 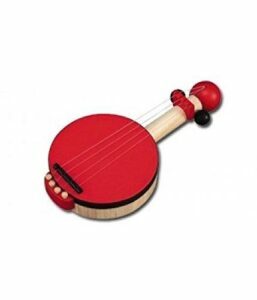 The beginner’s banjolele is ideal for children who are taking lessons and starting to learn to play properly. It is easy to transport to lessons using the included carry bag. It’s also great quality for the price, and will last for many years before an upgrade is necessary. It’s a great starting point for those learning to play, at a mid-price range. The Resoluute banjo is a great choice for children who are starting to take lessons. 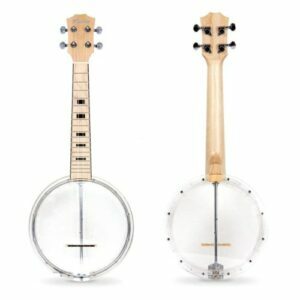 It offers all the features of a higher end banjo, but at a great value price. It’s perfect for beginners as it comes with a book teaching basic chord shapes to help kids learn to play something straight away. The banjo will last children for many years, as it is not a ‘toy’, and it can be used by teenagers and adults too.